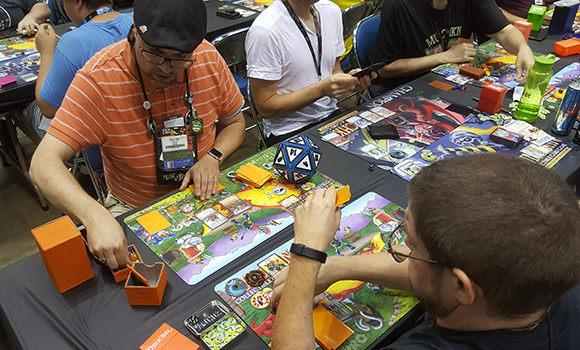 Daily Illuminator: Recapping An Incredible Gen Con! 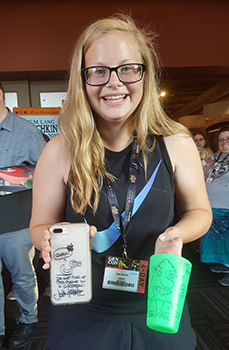 August 9, 2018: Recapping An Incredible Gen Con! We're back from Gen Con 2018, and we're wiped! 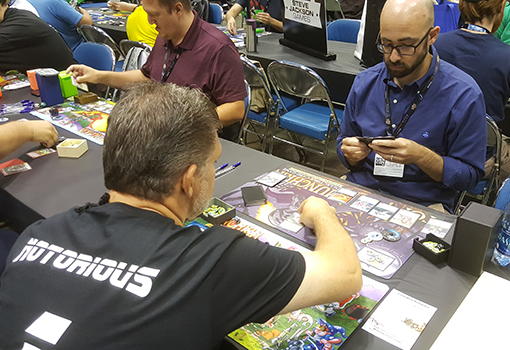 As always, Gen Con was our biggest show of the year, and we had a packed booth all show, as well as a ton of events around the convention. Huge thanks to our staff, event specialists and MIBs, Adventure Retail, and all the fans who came out to support us; we couldn't do this without all of you! 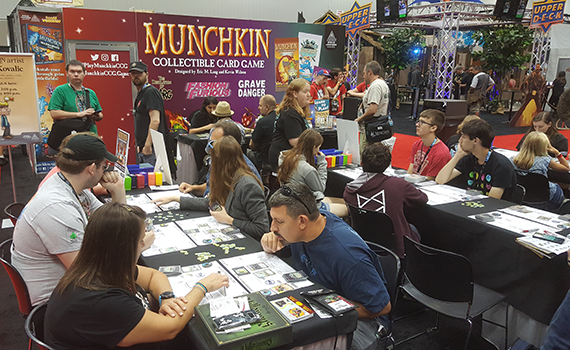 If you came by the booth, you probably got a demo of the Munchkin Collectible Card Game and a free booster pack, as well as a lot of promo swag. 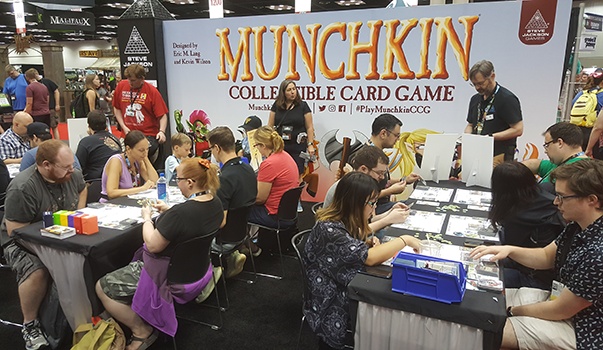 Apparently, you enjoyed it so much that the Munchkin CCG Introductory Set sold out twice next door at Adventure Retail! We also ran lots of sessions of The Fantasy Trip, promoting the Kickstarter project that's happening now. Veteran players got to see their beloved game return, and new players found out just how quickly you can jump into a fantasy battle! While the booth was bumping, our organized-play area was jam-packed with tons of ticketed events. 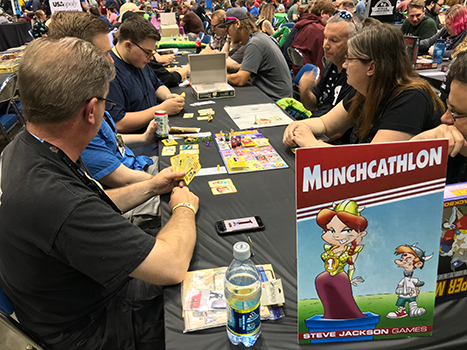 The Munchkin CCG and Munchkin how-to-plays filled up fast, and Andrew Hackard played some super-secret-Munchkin games, like Munchkin Crazy Cooks, with some very lucky fans. 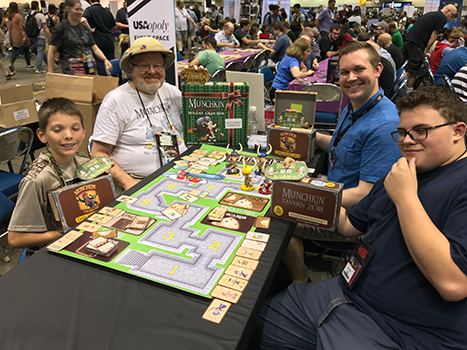 The winner of the Munchcathlon walked away with loads of loot after a marathon session of mixed-up Munchkin! 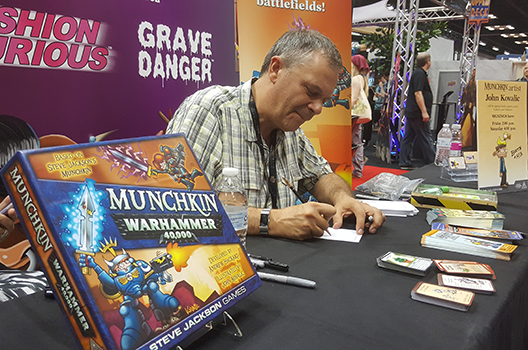 We even crowned our very first Munchkin CCG National Champion: Andrew Higgins! Players came from around the country to take part in our first major event, and Andrew faced the gauntlet to become the champ. If you were looking for a signature, then this was the convention to get it! 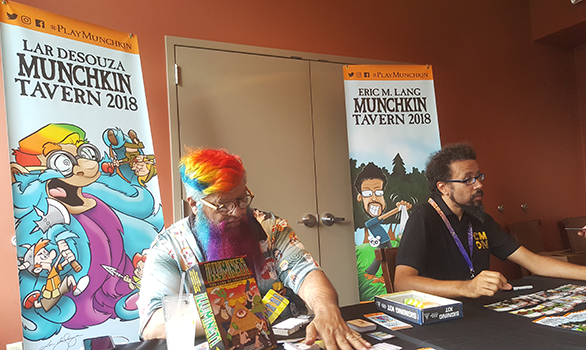 Munchkin Tavern was stacked all weekend, and John Kovalic's signings at the booth were queuing around the booth to get a drawing. 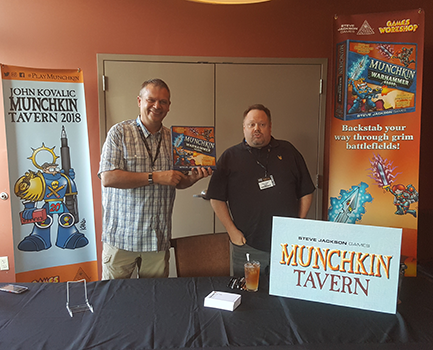 Thanks so much to John, Lar DeSouza, Eric M. Lang, and Howard Tayler for making fans happy, and to Tavern on South for hosting our events as always! 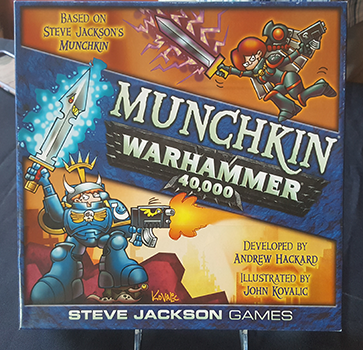 Speaking of Munchkin Tavern, our big announcement of the convention was Munchkin Warhammer 40,000! Our social-media pages are buzzing, and our friends in the press have shared the announcement to the ends of the solar system. Keep an eye on the Daily Illuminator and our social-media channels for more about Munchkin Warhammer 40,000, leading up to its release in Spring 2019. Now we're going to get some much-deserved rest (until our next show, at least). Thanks again to everyone involved with Gen Con; we can't wait to be back in 2019!